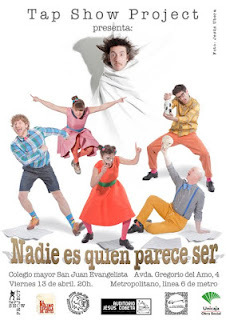 Last week I went to see a show called Nobody is who they seem to be Nadie es quien parece ser at the Teatro Alfil here in Madrid. The theatre is one of the most long standing and best known venues on the city’s very active alternative scene, and has recently removed part of the rows of seats to make way for a cabaret style table and chair arrangement, which makes it a perfect setting for this kind of show. This is the first full length show to be produced by the Tap Show Project. Tap Show Project’s original feature is that it is a dance group which specializes in tap. 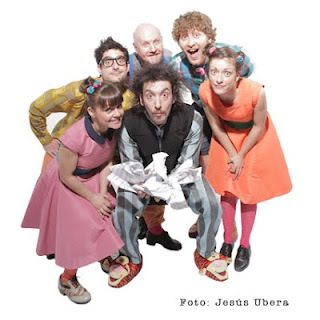 The show, according to the company director Lucas Tadeo, is aimed at catching the imagination of children and opening their eyes to the world of tap. According to John O’Brien, the show’s choreographer, it’s a great example of the best family entertainment, where parents take their children along and then find themselves enjoying it as much as or more than their children. There are lots of familiar elements as the evening goes on, a mad genius type writer looking for inspiration, who turns out to be the pianist, comedy routines and a large helping of audience participation. John O´Brien, Lucas Tadeo, Roberto Bonacini, Angélica Arévalo Moya and Ainara Prieto are the expert and always entertaining dancers who make this show stand out from the rest. Their routines vary from ensemble pieces to solos and include competitive dueling which is part of the tap tradition. The music is a mix of original tunes by the pianist Augustín López, and well know Broadway melodies. I expect that as the show develops there will be less dialogue to leave room for a couple more dance numbers, and that technology might be included in the moments where it would enhance the show, such as in the body percussion number, where some simple midi sound pads would make all the difference. My favourite moments of the night? Definitely the dueling between Lucas Tadeo and John O’Brien, and John O’Brien’s amazing solo number, showing off his brilliance as a tap specialist of long experience by bringing so many styles and so many changes of mood into one extended solo. Thanks Tap Show Project for a fun evening out, and good luck with the remaining shows coming up at the Alfil.